Cargo bikes are urban transportation for individuals, families, and businesses who want to do more on a bike. Nothing makes us happier than seeing a child get a ride to school on a bike. Cargo bikes aren't just for families. Cargo bike based businesses have sprung up all over the world, using the bike to serve clients. If you are a business who thinks a cargo bike might be right for you, contact us and we'll create a solution that's right for you! Don’t see the exact model you’re looking for from the brands we offer? We can bring them in by special order, too. Three wheels give stability, the ability to carry heavy loads, and up to four passengers! Add electric assist to increase your range and capabilities, and there is nowhere you won’t be able to go. The Babboe Bakfiets is a staple of Dutch culture. The biggest box, the most cargo capacity, and comfiest ride. The Babboe Curve Bakfiets adds comfortable suspension to its handling, while it is capable of carrying up to four children or a month’s supply of groceries with its stable front box design. The Mountain edition adds the powerful Yamaha 250w mid-drive motor to carry any load or climb all the hills. These bikes can be found on city streets around the world. Strong brakes, fenders, full chain guard, and a comfortable saddle, with fully internal gearing. Optional accessories include padded bench seats, a rain cover, and more! The Nihola Family is a lightweight, fast, and maneuverable tricycle design. It’s FUN to ride, and kids love zooming around in the front seat! Shimano Nexus 8 speed internal gear hub, low access height for box access. Galvanized steel frame with a chip-resistant powder-coated finish, and rain tent included, the Nihola Family is designed for outdoor storage! Maintenance-free components, and upright riding position, the Nihola Family is perfect for your family! The Carve Mountain is the latest and greatest cargo bike from Babboe. The best of both worlds: the stability of a three-wheel cargo bike combined with the agility of a two-wheel cargo bike. The ‘carve mechanism’ lets the box tilt with the bike when taking corners, so it feels as if you were riding a two-wheeler. A unique cycling experience with excellent handling! The addition of the powerful Yamaha 250w mid-drive electric assist motor and the step-less Nuvinci 330 gear hub you can get up to speed no matter how much weight you are carrying and then stop on a dime with powerful hydraulic disc brakes. Longtails and Utility Bikes (or E-tility bikes!) are the pickup trucks of the bike world. They drive “just like a regular bike” and have the capacity to carry WAY more gear and passengers! If you’re thinking about a foray into the world of cargo bikes, these are incredible machines that can be your everyday commute, grocery-getter, and still let you adventure off-the-beaten path. Twenty years ago, as an idealistic Stanford engineering student, Ross Evans landed in war-torn Nicaragua. In a tin and cinder-block shed, he welded together a revolutionary invention: a long-tail cargo bike that empowered farmers to pedal their produce to market. Xtracycle ignited a cargo bike revolution that’s spread around the world. Xtracycles are designed with the belief that virtually anything in your life can be accomplished with a bike and a sense of adventure. The Edgerunner is the ultimate cargo bike for your growing family. The swept back handlebars keep you upright while riding to your favourite cafe to read a book, or going with your kids to the museum. The small 20” rear wheel lowers the center of gravity for greater stability, improves acceleration from a stop, and makes it easy to load up to three children or cargo weighing up to 250 lbs. The 100% Chromoly steel frame is the perfect material, because it’s lightweight, strong, and durable. The Bosch electric motor is powerful enough to flatten hills, and shorten distances to your destination. This bike is built to grow with you for life. New 2017 “Swoop” frame design is recommended for all users. Realize your dreams. Sweeten your days. One pedal stroke at a time. Take a ride on this Bosch equipped electric bike and you’ll understand why “too hilly”, “too far”, “I don’t want to get sweaty” and “I can’t carry enough” are no longer good reasons to leave your bike at home. The Boost-E will have you looking for excuses to go on additional errands. This compact and extremely sturdy e-utility bike makes transportation fun and easy. It’s designed to carry heavy loads and has an interchangeable rack system that you can pick and choose from to fit your needs. The strong frame and big tires are the perfect pairing for the powerful Bosch motor. People describe the feeling of riding with Bosch’s leading e-bike mid-drive system like suddenly having super-powers. I call it the Boost. It’s not about how far and fast you ride or how many calories you burn. It’s about creating a more efficient and fun way to explore your town. I am just a simple guy that likes to ride his bike for fun and easy transportation. My objections and problems are the same as yours and if I can design a bike that inspires me to ride, I’m pretty sure you’ll like to ride it, too. For me, the art is finding the perfect balance of comfort, style, performance, quality and price. APRIL BONUS: Purchase a Benno Boost-E before April 30 and receive a FREE front rack! The fashionable Dutch-made e-bike you want to be seen on is now even better. The mid drive Bosch Performance Line motor makes the GazelleNL even more stable and powerful. It means you outshine everyone: in town, up a hill or on the way to work. The NL is a workhorse for cargo, with its sizeable front rack, and perfectly balanced frame, it can help move you, your belongings, and your family with ease! Enjoy effortless cycling with the smooth and powerful Bosch mid-mounted motor. The low positioning of the electric motor gives the bike a responsive and stable feel. The Bosch electric mid-mounted motor is ideal for daily trips as well as long distances. With torque ranging from 50 Nm up to a maximum of 60 Nm, it provides assistance on both flat and hilly terrain. Enjoy carefree cycling on your Gazelle! This bike was designed for you and your family. The Long John style of cargo bike is defined by a steering linkage between the handlebars and the front wheel. They originated as delivery bikes, but have evolved into the best balance of carrying passengers and cargo, while giving speed and everyday usability to the rider. Electric, or analog, these bikes are capable of replacing a family car with ease. As Copenhageners, Larry and Harry have always biked as much as they could. Not just because it was green, cool or cheap, but because it was – is – the fastest, most convenient way to get around town. Harry had a contract business (building, not Goodfellas) for 20 years where he used a 60-year-old Danish Long John cargo bike to get from job to job. Larry was busy working for another Danish manufacturer, making the best cargo trike in the world. The problem was Harry’s vintage Long John was still faster, lighter and more manoeuvrable. That’s when Larry and Harry decided to build the perfect cargo bike. The centerpiece of the Larry vs Harry lineup is the e-Bullitt 6000. Its seamless Shimano STePS motor makes worrying about the headwind, steep hills, and huge load a thing of the past. The Bullitt frame can carry up to two children, and tons of cargo (seriously, check out the Bullitt on Pinterest)! The box is fully customizable to your needs, and the bike rolls so smoothly you'll hardly notice you're on a cargo bike at all. Demonstration model available in-store, book your test ride today! 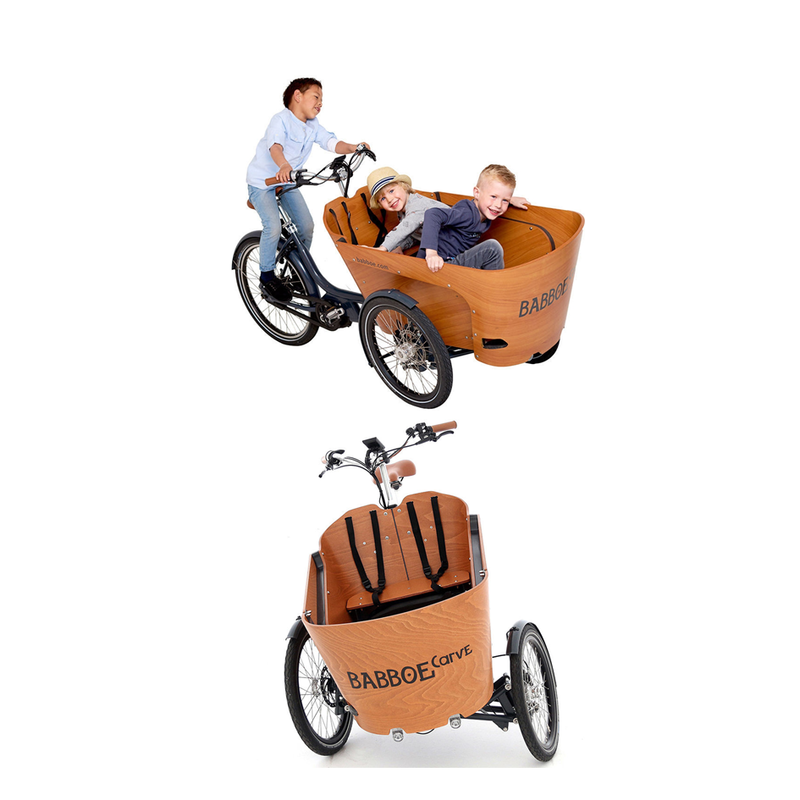 The Babboe City is an agile urban transportation solution. The City is big enough to carry up to four small children, or a week's worth of groceries for a family of five. It gives a smooth and comfortable ride, even when loaded, and is nimble enough to navigate downtown streets with ease. Most importantly, kids love riding in the front box, and parents love seeing their kids having fun! The Babboe City Mountain is driven by a Yamaha mid-drive motor with force sensor and has a Nuvinci stepless shifting system. This combination offers a smooth cycling experience! Agile, fast and light. Its slender design makes this cargo bike very practical on busier roads. We think of this bike like an urban canoe. Gorgeous, timeless, efficient. Love our Cargo Bikes? Check out our Hybrid/Commuter, Single Speed Bikes, City Bikes, Gravel/Adventure Bikes, and Kids Bikes!